A $15 an hour Minimum Wage...Can Toronto Do It? "Is a $15 an hour municipal minimum wage possible in Toronto as City Councillors in American cities like Chicago, New York and Seattle have been fighting for, or is it true, as John Tory says, that it is a provincial issue? It is possible. The reality is that almost all municipal politicians simply want to pass the buck. How can a municipal minimum wage be achieved? There are at least three ways"
Free Transit, Municipal Minimum Wages, Affordable Housing...Can Toronto Do It? 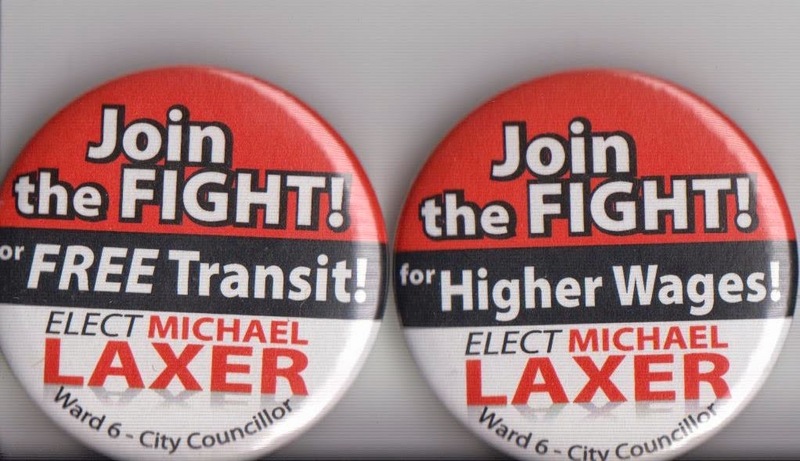 Meet Ward 6 Candidate Michael Laxer & Discuss the Issues! Join the Fight! For Free Transit & Higher Wages! When: Saturday, July 5th, 2014, 1 p.m. - 4 p.m. Politicians tell us that initiatives that would change our city and people's lives like Free Transit, a $15 an hour municipal minimum wage, a comprehensive affordable housing strategy and a real alternative to cutbacks and austerity are not possible. Is it true...or are they saying this because in reality they don't want to do it? On Saturday, July 5th, come out anytime between 1-4 p.m. for an informal drop-in for coffee, refreshments and discussion and to meet Ward 6 City Council candidate Michael Laxer and find out where he stands on these (and other ) issues and how he thinks we can do it! Find out about his income pledge to, if elected, make no more than what the average Torontonian does and his ideas for a more democratic City Hall and police accountability. Get answers to any questions you have about, Michael's campaign, and the fight for higher wages, public services & a real alternative to cutbacks and austerity. For further details call 416-251-5576 or email us. Couldn't Find What You Were Looking for in the Provincial Election? Join the Fight in Ward 6! Join the fight! And get the button too! Now that the Ontario election is over, are you looking for a campaign that you can really get behind; one that is directly and openly fighting for the polices you were looking for in the platforms of the parties but couldn't find? Policies that would impact people's lives in direct and actually meaningful ways? There is one! 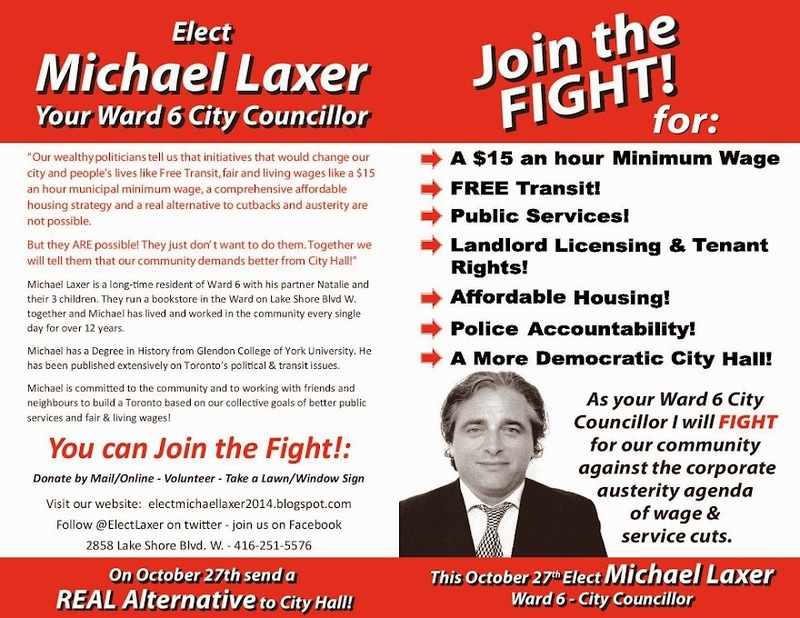 The Michael Laxer Ward 6 Campaign for City Councillor! Between now and October 27th we will be fighting for a real agenda that is a real alternative to cutbacks and austerity and we need your help! Volunteer, donate (and you can donate if you live anywhere in Ontario), take a lawn sign (for after October 2nd)....anything you can do to help would be greatly appreciated!